Excellent pistol, great price. The Q4 has the performance and features I wanted. Did some homework. Checked reviews. Watched comparisons of similar hand guns. Good product. Good price. Been looking for a Walter or Glock and just couldn’t pass the deal up and 3 mags & a threaded barrel made it easy to buy. This is my second gun with GrabAGun and they are fast and I enjoy dealing with them. Great price from a great store....many thanks! I love my PPS M2 LE and after 18 months, I can finally add the PPQ I've been wanting. Best price available and quick shipping too! This gun fit perfectly in my hands. Already have a PPQM2 and it’s amazing. 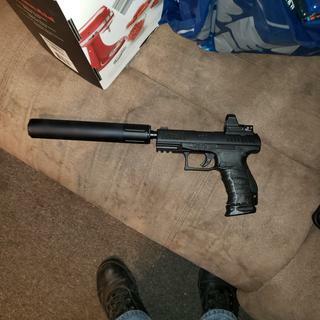 I want another set up specifically as a suppressed pistol so I can carry the other. Best trigger in its class, comes premilled for a red dot, threaded barrel, and 2-17 round mags! What more could you ask for!?! 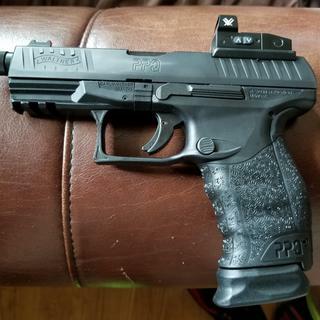 I have been a huge PPQ fan and decided to get this for a suppressor host since suppressor height sights are difficult to find for the PPQ being able to place a red dot on the firearm makes things much easier. Fantastic reviews on this firearm and Walther is a great company. Nothing but good reviews, all around, have a friend that has shot many guns and this is his favorite. This is my fourth Walther. Awesome trigger, my 3rd Walther handgun. 2nd one I've bought. Sweet trigger and light weight. I have a PPQ M2. It has a great trigger. I wanted the same gun, but with a threaded barrel and an RMR cut. Worlds best trigger. Threaded barrel and setup to install a red dot. Perfect combination at a great price. I wanted to pick up a 9mm that was reliable and something I can build off of. I own MANY handguns but putting your hand around a Walther feels like putting on your favorite pair of gloves. Walther's attention to detail, quality, ergonomics and trigger made me buy my fourth Walther. I shot my wife’s PPQ and loved it. It is a sweet gun. I have 5 other Walthers and they fit the hand real good and the best triggers of any pistols on the market.Also they are accurate. I am putting a red dot sight and a suppressor on it. The Ergonomics of this hand gun are amazing, I feel like it's an extension to my hand. Very comfortable to hold and shoot. With the threaded barrel and rear optic being interchangeable it's a hard deal to beat!!! Have a Walther P22 and am very satisfied with all aspects of that weapon. Moving up to a heavier caliber seems like a logical step. Hopefully the reviews i have read will not fail me on this choice. Big walther fan. Needed a milled slide..
Great price, easy to use site. I own a PPQ in 45 acp and it is a very accurate handgun. I like the quality of the Walthers. Walther quality, threaded barrel, red-dot ready, comfort grip and one of the best triggers you can get. I wanted a new pistol to go with my Sig SD45 Suppressor. After extensive research and test firing this against the HK VP9, this was by far the best choice. The PPQ M2 Q4 and the HK VP9 were almost identical to shoot. The Walther won in the end because of the optics plate (I'm mounting a Vortex Venom), better trigger, and it never failed to lock back (used VP9 at two ranges both had locking issues). BEST ANSWER: Gun of course, 2x 17 rounds mags and 1x 15 round mag. 3 different sized plates for optics attachment, different grip size attachments, and lock and key. The gun, 3 17 round magazines, 1 15 round magazine, 3 adapter plates for the red., and a new spring to run suppressed, and a cable lock. The gun, optics plates for red dot sights(3-4), back straps, 3magazines, lock, chamber flag, paperwork. Magazines, additional recoil spring for running a suppressor, 3 optics plates, cable lock. BEST ANSWER: while no gun is truly "ambidextrous" - we can't swap the ejection port - the Walther"s controls are more closely mirrored than most manufactor's. The slide release lever on this gun actually works just as well from either side, the grip is amazingly comfortable from either direction and the slide is serrated practically front to rear. I don't know all of the challenges of a lefty, but this gun is as close as I've seen to ambidextrous. There ARE guns that also have an ambidextrous magazine release, although they are more rare. The FN 509 has ambidextrous standard push button mag release, and the paddle releases on the PPQ M1 and HK VP9 are ambidextrous. So if you want truly ambidextrous, this is not the gun for you, but it's as close as your average Glock, Sig, etc. The slide release has a lever on both sides and the magazine release is reversible; you will need to swap it over for a left handed shooter. So, It depends on what you mean by ambidextrous. You will need to choose which side you want the magazine release on, but it can be used on either side. Yes, the PPQ Q4 TAC has the slide release on both side and no safety. The magazine release is on the left side as shipped on mine, but can be switched the right side. All versions of the PPQ have a slide release on both sides of the frame. The mag release button can be positioned for right or left handed shooters. Yes, the safety and slide stop are ambidextrous. View the gun's information on the manufacturer's page for full details. The slide release is ambi and the mag release can be reversed. The slide release is, the magazine release is reversible. . Yes. The mag release can be swapped over. yes and worth every penny! Is the Walther Barrel threaded 1/2"x28 or is it metric? BEST ANSWER: 1/2”x28 tpi, per Walther’s web site but have personally yet to put the suppressor that is being held hostage pending a stamp on it. It is the standard thread pitch for running a suppressor. 1/2 x 28.
it's 1/2x28. Fits perfectly on my SilencerCo can. I have several striker fired pistols. I have to say that this is perhaps the best factory trigger I have felt. That includes my HK P7! Excellent choice has all the features and the best out of the box trigger. Shoots right on the money. You can't go wrong with a PPQ. So far just over 500 rounds and no issues. Excellent firearm! High capacity magazines. Very accurate. Nice crisp trigger pull with quick reset. Love it and it’s everything I thought it would be and mire. Just Plain Fun To Shoot! Fits my hand perfect. 600 rounds so far. 15 different brand and weight bullets. FMJ and JHP. (No steel case but why would you?). Honestly Perfect. Zero issues. Grab a Gun is Zero Issues too. Repeat customer and will again many times. Usually the BEST price and FAST shipping. We've shot tons of guns... Ours, Our Sons, Friends, All of the Ranges' rentals but the Wife and I have a new favorite. Can't wait for the HS507C to come back in stock. One of the best striker fire triggers. Walthers have great triggers. This is number 6 for me. Liked it so much I bought another one. Everything you read in the marketing stuff is true. Awesome ergonomics, and the best trigger on a polymer gun period. I’ve been carrying 1911’s for years, and now this is my daily carry. Put a red dot on it and this is the perfect pistol. This gun conceals perfectly and feels so natural when you hold it in your hand. Also very light for the size. Will be going to the range soon. Took my Q4 out the other day and ran flawlessly. Also best price I could find anywhere for this pistol. I would definitely recommend this gun. Smooth trigger, fits the hand. I have put 200 rounds through the gun so far, and not one issue. I 'm going to have to buy myself something else. My wife has taken this one away from me. Dang it. I let her shoot it before I did and she said I have to find myself something else. Oh well I guess I'll just have to take her advice. Wooh Hoow!!! I've got a new shooting buddy...…….Hummm Now what??? Great gun easy to shoot. Paid 589.00 for it and a week later it was 569.00. Grabagun said they could not reimburse me the 20 dollars. 5 stars for the gun 3 stars for customer service. Ergonomics and trigger are incredible. I love it! Very happy with my purchase. The ergonomics are very nice. easy to hold and a very comfortable weapon to shoot. throw a RMR on it and you have an awesome platform. Awesome handgun. Incredible trigger, very comfortable to hold and shoot. Great like all PPQ's. just needs a couple things to meet the competition and true suppressor readiness. The PPQ is a fantastic gun as folks know, the Q4 is no different in what it shares with the base gun such as great trigger, high accuracy, and flawless function. However as being marketed as suppressor platform with optics mount, 1 star away from perfection. The Q4 should have full height suppressor sights so they dont get blocked by a can like the standard ones mounted. So it is not in fact suppressor ready as Walther indicates. They should also consider a dovetail separate from the optic cut to retain the rear iron sight in the event of an optic failure. With those it would steal much of FN 509's thunder. if not even make it superfluous given the FN trigger. Love it Best out the box trigger out of any of pistols. Well built machine. Very accurate right out of the box. Highly recommended! Under rated , great trigger, great platform for a suppressor. There are many review videos and articles about all the amazing specifications for this pistol, so I'm only going to focus on why I decided to buy it compared to other options. Primarily, I wanted a 9mm that I could shoot suppressed. After months of reading reviews, I narrowed my choice between the PPQ M2 Q4 Tac and the HK VP9. Both are two of the most amazing pistols I've shot. I'm a huge fan of the Beretta 92/Taurus PT92 platform for shootability and accuracy. I shot the Q4 and VP9 side by side at a local range, and for all practical purposes, they were the same gun. Both had smooth triggers (sorry Glock fans), quick follow up shots, and excellent accuracy. I actually shot the VP9 better and with slightly smaller groups. Two things made me choose the Q4 before we get into price and features. I fired two different VP9 range guns and both had failures to lock on last round and a trigger that had become too smooth. It did not have the positive engage that the Q4 did so I knew exactly when the shot would discharge. Yes, range guns are shot to death, but that was a big concern. In the end, I don't think there is a better package available for shooting suppressed. For around $600, you get a threaded barrel, 3 mags, 3 red dot bases (slide already cutout), and they even include a dedicated suppressor spring. Also, you can buy affordable (not cheap) mags compared to the $50/mag HK wants. Every option I looked at to buy or convert other pistols put me halfway or more to this same price point. I purchased a Vortex Venom red dot to add soon. I've had great luck with that site and only $220. I run it on my Volquartsen Scorpion, so this will be a nice pairing. All and all, I couldn't be happier with the pistol package. Absolutely awesome pistol! Read a lot of reviews before I bought it and could not be more satisfied! The trigger is bad a$$ and the price at Grabagun was a deal! Buy it! This was my first experience with a firearm experience through Grab-A-Gun and I could not be happier. My local gun store was not listed as a Grab-A-Gun FFL delaer, but they sent their FFL information to Grab-A-Gun within a few hours of my online purchase. To my amazement, the gun was delivered to my local gun store the next day. Very impressive! This was an excellent buying experience. Great trigger. No malfunctions after 200 rounds so far. No problems mounting my burris fast fire 3. Bore axis is high but on a 9mm not a real issue. Beautiful gun, amazing trigger, and a great discount. I've had no issues with the Q4, I love the ergonomics and the trigger. I mounted a deltapoint red dot which works great, but it's a little tall. Maybe looks for a lower profile optic, the 3 mounting plates accomodate almost all the models out there. I have not mounted a suppressor yet, so I cannot comment on that functionality. This is a great gun. Walther with the silky smooth trigger. When grouped with various competitive pistols on a bench, people unfamiliar with each of the pistols ends up shooting the best group with it. This is my third Walther centerfire pistol of the PPQ series and one of my favorites at the range. With a red dot and the amazing stock performance of this pistol, standing 100 yard shots on steel targets as small as 6 inches are possible with consistency. I look forward to adding more of the PPQ series to my collection. Fantastic pistol. Accurate, light weight, and easy to conceal even with optics. The accuracy out of the box is amazing. The trigger and grip ergonomics aid in this area. You will not be disappointed with this gun no matter your experience. MAGAZINE DESC:(2) 17 rd. & (1) 15 rd.